Do you still want to go back to the childhood starry sky? Do you want to relive the fantasy of that year? Or have your child wondered what is the starry sky real like on earth? make you and your kids to live in the light of the magical night and go to sweet sleep. - Great for decorating wedding / baby room, birthday, festivals and parties. - As a gift for friend, family, and sweetheart, It is the best choice for you. - Built a romantic and festive atmosphere , help to soothe and relax yourself. Button LED shows steady on yellow light; press it again to turn it off. Button STAR shows three colors change from one by one（blue, green, red, ); press it again to turn it off. Please note that the USB cable and the batteries can not be used at the same time. 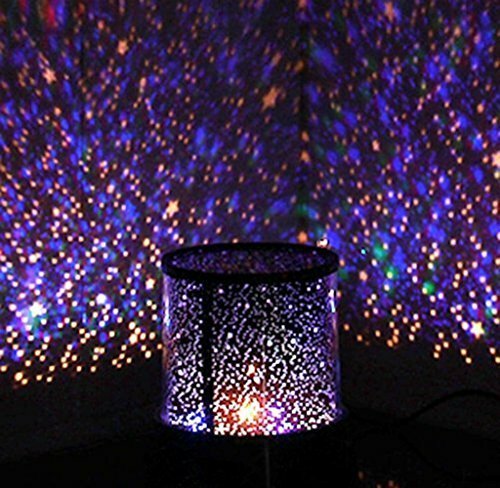 Unbelievable star protector night light: -- The stars were cast on the ceiling when the light on, showing an memorable night you can share with you family or friends. This is help for arousing curiosity in the kids for universe and astronomical science and fall asleep at night. Multipurpose: Ideal for decorating baby room, wedding, birthday, festivals and parties, creating a special and romantic atmosphere in your bedroom or other indoor use. As a gift for your friend, family, it is great. Battery-powered or USB Powered: Power by inserting 3pcs AA batteries or connecting to a USB outlet of PC or power adapter. Two Modes: One mode: The Nightlight light (yellow light), press LED button again would shut off this Model. The other one mode: switch for the light color (green, blue and red, colorful light overlay), press it again to turn it off. You can control the colors and movement with the push of a button to alter your experience. Our Customer Service: If you have any questions or suggestion for our products or services, please feel free to email us. We will reply you within 25 honours and do our best to offer you a satisfactory service. If you have any questions about this product by Katech, contact us by completing and submitting the form below. If you are looking for a specif part number, please include it with your message.